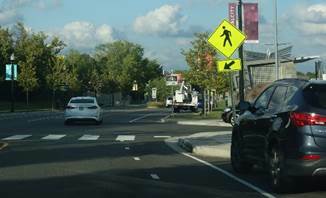 The FHWA provides this information to practitioners about acceptable methods of enhancing pedestrian safety that can be implemented at uncontrolled marked crosswalks. The FHWA continues to be committed to helping practitioners reduce the number of pedestrian injuries and fatalities that occur at uncontrolled marked crosswalks each year. Pedestrian-activated Flashing LEDs in the Border of a Warning Sign –Section 2A.07 describes the use of flashing white or yellow LEDs in the border of a pedestrian crossing warning sign. 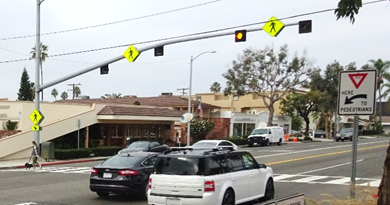 The flashing LEDs may be pedestrian activated to increase their effectiveness in making the crossing sign more conspicuous when a pedestrian desires to cross the roadway. Enhanced Conspicuity of Pedestrian Crossing Signs – Section 2A.15 describes numerous methods that may be used to improve the conspicuity of regulatory or warning signs that are associated with pedestrian crossings. Yield Here to (or Stop Here for) Pedestrians signs – Section 2B.11 describes pedestrian crossing signs that may be placed upstream from a crosswalk to inform drivers on multi-lane roadways that they are legally required to stop a specified distance in advance of the crosswalk if a pedestrian is crossing the roadway. Overhead Pedestrian Crossing Signs – Section 2B.12 describes pedestrian cross ing signs that may be mounted over the roadway to make it easier for drivers to notice that a crosswalk is present, especially from a greater distance than they would for post-mounted signs, and to inform them of their legal obligation to stop if a pedestrian is waiting to cross or in the process of crossing the roadway. In-street Pedestrian Crossing Signs – Section 2B.12 describes pedestrian crossing signs that may be placed in the street to notify drivers that a crosswalk is present and to inform them of their legal obligation to stop if a pedestrian is waiting to cross or in the process of crossing the roadway. High-visibility Crosswalk Markings – Section 3B.18 describes the various types of crosswalk markings that may be used, including those that include diagonal or longitudinal lines to increase the visibility of the crosswalk to approaching drivers. 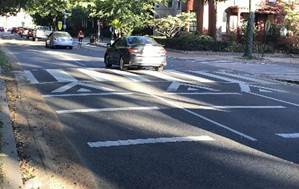 Additional information on crosswalk marking patterns is available in a recent study, Crosswalk Marking Field Visibility Study (Report No. FHWA‑HRT‑10‑068). Midblock Pedestrian Signals – Sections 4C.05 and 4C.06 describe warrant criteria that can be used in a signal needs study of a marked crosswalk location to determine if the installation of a midblock pedestrian signal is justified to assist pedestrians or schoolchildren in safely crossing the major street. Pedestrian Hybrid Beacons – Section 4F.01 describes warrant criteria that can be used to determine if the installation of a pedestrian hybrid beacon is justified to assist pedestrians in safely crossing the major street. Pedestrian-activated Warning Beacons – Section 4L.03 describes the use of a flashing yellow warning beacon to supplement a pedestrian crossing warning sign. The warning beacon may be pedestrian activated to increase its effectiveness in making the crossing sign more conspicuous when a pedestrian desires to cross the roadway. 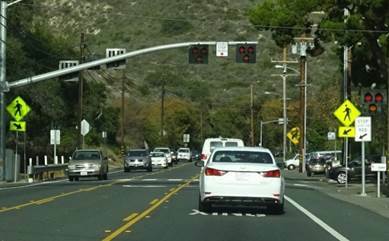 In-roadway Warning Lights – Section 4N.02 describes pedestrian-activated yellow lights that may be installed in the roadway surface at an uncontrolled marked crosswalk location to warn drivers that a pedestrian is waiting to cross or in the process of crossing the roadway. Curb Extensions (bulb-outs, neckdowns) – This feature, which is particularly beneficial in urban settings where on-street parking (either parallel or diagonal) is present, shortens the crossing distance and allows the pedestrian waiting to cross to be more visible to the approaching driver. Where physical construction is not immediately feasible, neckdown of the street width at the crosswalk can be accomplished on an interim basis using markings and flexible delineator posts to achieve a traffic calming effect similar to that of a curb extension. Pedestrian Refuge Islands (median islands) – This feature, which is particularly beneficial on wide multi-lane roadways, allows pedestrians to cross a two-way street in two stages by finding a gap in one direction, and then stopping on a median island of sufficient width to wait while searching for a gap in the other direction of traffic. Raised Crosswalks – This feature improves pedestrian safety by forcing drivers to slow down when traversing the crosswalk location. 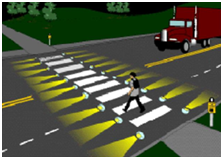 Crosswalk Lighting – This feature improves pedestrian safety by allowing the pedestrian waiting to cross or in the process of crossing to be more visible to the approaching driver during nighttime conditions.